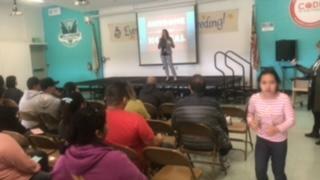 On February, Dr. Nicole Jacobson welcomed Willmore families to highlight the school's work in computer science. Computer science immersion has joined the Spanish Dual Immersion program to further develop literacy and competency in our 21st century global society. At Willmore, students have the opportunity to become multi-literate in English, Spanish, and Computer Science. 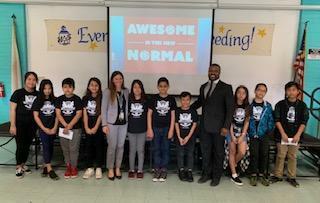 To kick off the showcase, coding coach Dr. Martin addressed the audience, and then Willmore students took charge of the opening keynote presentation. Willmore student ambassadors then guided groups of visitors to classrooms in order to view the progression in the coding curriculum. They were able to see projects in Kindergarten, Third Grade, and get a preview of the upper grade robotics curriculum in the Innovation Lab. 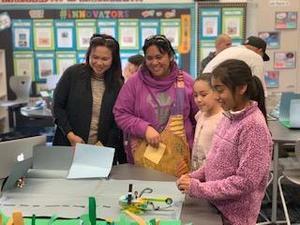 To end the tour, families were invited to visit their children's classrooms to celebrate their accomplishments. All were amazed at what our students are doing at Willmore! See the link below for a glance at what we are doing for ALL students.